Screen Shot from 'Random Testing Unit'. Towards the end of last week, inspiration hit with an animation idea I could create relatively quickly in Muvizu (so I thought). Over three days I wrote a script with the working title of 'Random Testing Unit'. I can't go into great detail about the script as it would spoil some of the initial humour. 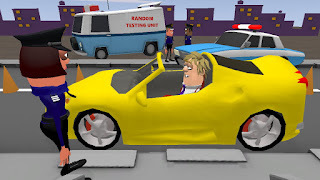 I can tell you, the basic premise is a comedy sketch featuring a Police, Random Testing Unit, road stop and a driver who is stopped to be tested. The finished animation will run for around 3 minutes. By the way, if you're looking for script writing software the free, online version of Celtx is great. I swear by it as the easiest and fastest way to write a script. The paid version has many useful tools but for me, the script writing tool is enough. About two days into writing my script I felt confident enough that it was going to come together so I began designing my set in Muvizu. What I've come to realize with 3D software is that, you can save a lot of time if you just design the parts of your set that will actually appear on camera, instead of creating whole environments and then planning your camera shots. Overview of my Muvizu set. Inset are my four key camera shots. You can see in the image above that my set is very sparse but you can't tell this based on my key camera shots that are also shown. Note to Muvizu's creators: You really need controls in your studio that let you precisely position props using X, Y, Z co-ordinates. Or at least have X, Y, Z widgets that can be controlled with the mouse (like most 3D software does). Currently trying to precisely position objects is next to impossible, even with snapping on. Plus it's so easy to bump already positioned objects out of place. I wasn't going to storyboard my animation but Muvizu kind of demands that you do. 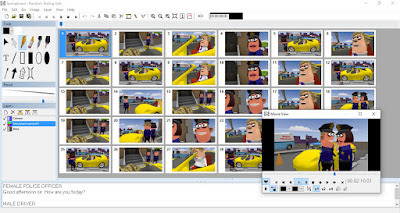 For storyboarding I use Springboard Storyboarding software from Six Mile Creek Systems. Below you can see my entire storyboard in Springboard - minus all the descriptions etc. because a) that would spoil the animation and b) You have to print or export your storyboards to get all the descriptions along side the frames. Storyboard frames in Springboard for the entire animation. 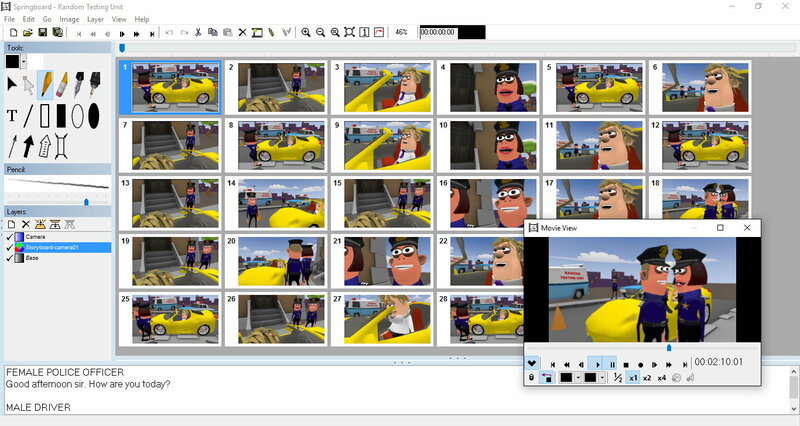 If you look closely at my storyboard you'll notice there are a few more camera shots than the initial four I set up. For each frame I just inserted the camera view for that piece of dialogue. I made no attempt to pose the characters (other than to make them face the right way for the scene) or to get their facial expressions correct. I also recorded a version of all the dialogue myself, which I loaded into Springboard, enabling me to create a nice animatic of the storyboard, giving me a sense of what the finished animation may be like. Presently I have started animating. What I thought was going to be a quick two day job hasn't quite panned out. 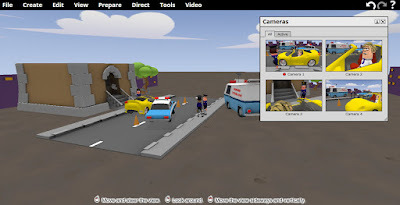 Whilst the tutorials for Muvizu make animating through directing the characters seem easy, It isn't. Took me a couple of hours to animate the first three frames of my storyboard. Using a mouse to puppet characters is not a precise process - but for some reason the same technique is easier and more responsive in Reallusion's CrazyTalk 8, CrazyTalk Animator 2 and iClone 6. Not being able to key frame characters in Muvizu (even if you buy the key frame plugin) is a real shame. Anyhow, I got a bit discouraged by that point. This was supposed to be a short, fun project with software that claims to be the 'easiest and fastest' way to tell stories with animation. Granted I've only spent five days on this so far but I'd just like one project to not present me with unexpected road blocks. That aside, I do plan to fire up the Muvizu studio again and get back to work on it. Despite the problems it's still a fun program to use. I'm pretty sure once I get some experience with it under my belt it will be a much easier and quicker process. I'll look forward to showing you the finished animation soon. David, it is great to see this. I have been using Muvizu, too. The community is awesome on the forums, and I have learned a whole lot. It will be great to follow what you are doing there. I have been combining Muvizu with Hit Film Express until I opted for the Pro version. Watch for sales. I save everything as Image Sequence shots and then compost, edit, and add the audio in Hit Film. I do make sound tracks in Muvizu to get the lip syncing better. I hope to keep in contact. I would be interested to see your Muvizu work. Particularly how you're using Hit Film with it. I'm aware of Hit Film but haven't tried it since, so far, Serif's Movie Plus has been more than enough for my video editing needs. I've not had time to get into the Muvizu forums but I am aware there are some really talented Muvizu creators within that community. Might be something I get into more once I get past this first project that's gone from a quick little side project to a mini epic of headache-y proportions (Seriously - I'd rather be doing the Muvizu Bat Storm animations I had planned than this project but I think the script on this one is worth effort so far). Thanks for sharing your experience of Animation. Really helpful information.